Brian Bomeisler received a Bachelor of Fine Arts degree from Pratt Institute/Brooklyn, New York in 1975, and has been a working and showing artist since then, living and working in Soho, New York City. In 1985 he received a Fellowship from the NEA and has paintings in collections at The Museum of Contemporary Art, La Jolla; The Hyde Collection, New York; corporate and private collections around the world. He has also been an instructor at the New York Academy of Art for a number of years. Brian's illustrations appear alongside the text in The New Drawing on the Right Side of the Brain. What Goes on Inside a 5-Day Drawing Class? The following articles, which appear in American Artist: Drawing, will tell you a bit more about what happens inside a 5-day class. 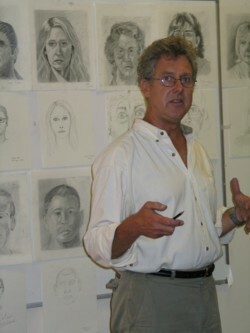 Brian explains what he is trying to do with the students, you can see some student drawings too and read what they have to say about their experience in learning how to draw with the Drawing on the Right Side of the Brain® method. Alternatively, sign up for our free newsletter Drawing Matters and be the first to hear about dates for new courses, what's new on the website, plus information about drawing-related matters and events.